You’ve seen all the movies. You’ve read—and reread, and rereread—all the books. It’s about time your Harry Potter obsession had another way to manifest itself. 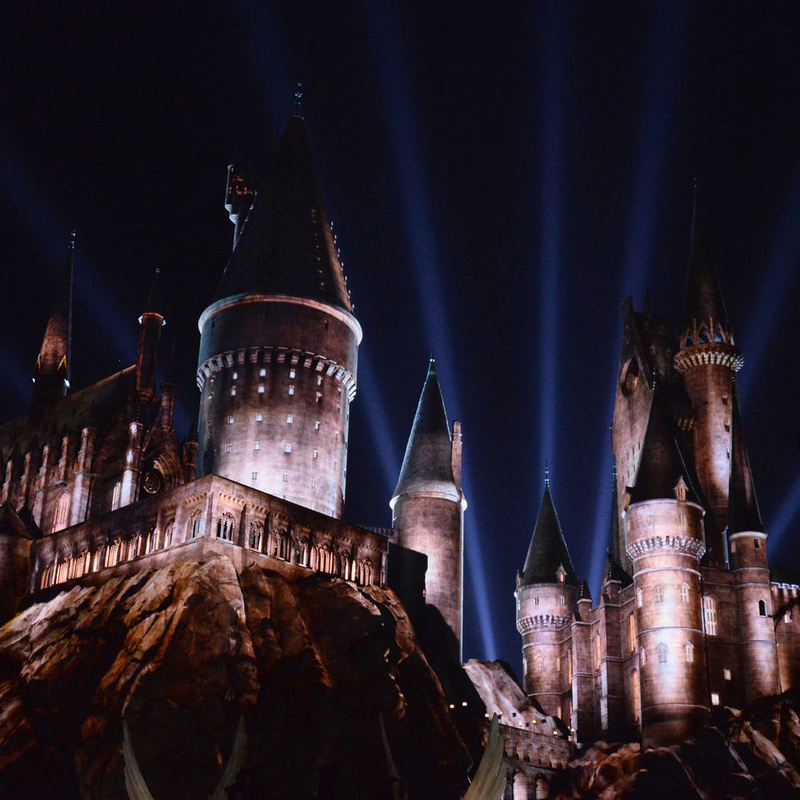 Enter L.A.’s brand new The Wizarding World of Harry Potter, which opens at Universal Studios Hollywood today. Here, fans can taste Butterbeer and Bertie Botts Every Flavor Beans, walk through the streets of Hogsmeade, and explore the halls of Hogwarts. Though the park has only just opened (and, yes, tickets are already sold out), we’ve got the scoop on the secrets and spells behind the newest Harry Potter experience—including which movie props are hiding in plain sight and the surprising story behind the house sweaters for sale. There is no technology used to power Hogsmeade. Well, at least it’s supposed to appear that way. To keep within the parameters of the Wizarding World, bulbs are disguised within fixtures intended to look like oil lamps and candelabras, pulley systems are used to move items and hearths appear to warm food within Three Broomsticks. The main exception to the electricity rule? Transportation. The Hogwarts Express would be electric because it came from London, and the flying car on display outside Hogwarts isn’t technically mechanical. It’s enchanted! Go ahead and chat up the train conductor at the front gates. He’s ready and able to answer any questions about where Harry is, what Hogwarts is like for school, and even give you details about Hogsmeade’s finest dishes. Eleven different locations throughout the village are interactive. This gives budding young wizards the opportunity to perform and perfect a multitude of spells with their wands. A Hogwarts Express photo opportunity lets guests to sit inside what appears to be a mock train booth, but is actually incredibly close to being aboard the real thing: the luggage racks overhead are actual props from the movies that Harry and Hermione sat under and the seat fabric was sourced from an authentic train manufacturer. Hogsmeade is meant to be 1,000 years old. But within it, some buildings are newer than others. The most ancient of them all is Three Broomsticks, which has the dim quarters and low ceilings in line with a centuries-old pub. It’s not just Hogsmeade’s main restaurant, either; it’s also an inn. Look up at the entrance and you’ll spot various doors and windows where wizards are likely to be spending the night. Scan the upper level for trunks from lodging guests—they’re actual props from the movies! Sadly, you won’t be able to attend a real-life version of the glorious Christmas Feast in the park, but you can eat like you’re at one. One of the offerings at Three Broomsticks is the aptly-named Great Feast, a platter of whole chickens, corn-on-the-cob and spare ribs that will get you as close to the Grand Hall’s spreads as possible. While dining with your group, take a close look at the rustic paintings on the walls, which were recreated from the film sets. The broomsticks on display here and at the Dervish & Banges shop are created by the makers who assembled them for the movies. The namesake three on the wall at the beloved pub are significant, too—it means three wizards are somewhere in the restaurant! The Wizarding World feels like a movie set. The shrunken heads on display at Hog’s Head Inn were recast from the original molds, and other curious elixirs and oddities behind the bar are just as intriguing. Order a glass of an authentic Harry Potter-inspired beer, and rest assured that you’re indulging in the real thing—J.K. Rowling herself approved them. There are a lot of cool things you can take home. Not only can wizards and witches buy a wand, they can also take home Butterbeer Fudge (one of the lesser-known options for sale at Honeydukes) or a house sweater. Those for sale at Gladrags Wizardwear are made in Scotland at the same wool mill as sweaters used in the films! The details—especially throughout ride lines—are astounding. Hogwarts School is supposed to be one thousand feet high so designers used forced perspective to make it appear larger than it actually is. Though the queue to ride Harry Potter and the Forbidden Journey will likely be long, there’s plenty to enjoy while you wait. Just before exiting the greenhouse into the first Hogwarts hallway, keep an eye out (and an ear covered!) as you approach mandrakes tucked within a large cage. Hundreds of portraits used throughout the building were recreated from the set and Dumbledore’s office contains several small props from the movies, too. Step through the Defense Against the Dark Arts classroom, and watch alongside Hermione and Harry as Ron attempts to cast a spell. Something different happens each time, and one of his mistakes actually makes it snow inside! The school desks and sign behind the chalkboard are also special, as they too came straight from the movie set.